Do you want to save money? Black stained roofs cause excessive heating in the home, ages the petroleum base and dries out the shingles. Black streaks are not just ugly; they are eating the limestone off your shingles. That’s right! These guys are called gloeocapsa magma and the environment is providing them with a buffet on your roof, inviting all their friends to the dinner table. This bacterial ecosystem consisting of lichen, algae, black mold, and moss also can cause allergens to be tracked in and around your home. 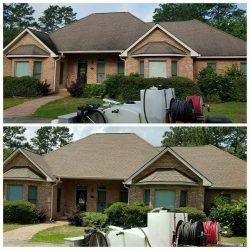 Roof cleaning not only provides an instant curb appeal, it is the manufacturer’s recommendations to extend the material lifespan. Thanks to our cutting- edge technology, specially formulated cleaners and equipment, 99 % of the time we do not even need to walk on your roof. This is a safety and liability that just is not needed in most cases. 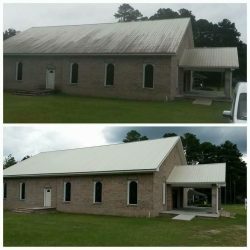 Our method of roof cleaning utilizes a completely safe practice using use a soft wash technique to safeguard against harmful pressure. High pressure can void your warranty, remove excess shingle granules, crack slate and tear up the roofs material. Our no-pressure process and specially formulated cleaning agents, provide an instant result without harming your roof such as high-pressure erosion and agitation can do. 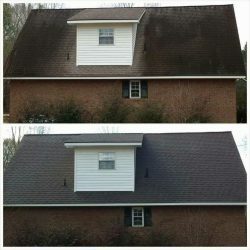 In fact, your roof will look even better after multiple rains. The cleaning agents get to the root of these micro-organisms and stop them in their tracks. Moss will turn into white cotton balls. We do not force these off as the root is attached to the shingle granules. After a few rains and windy days, they will blow off when completely dead. 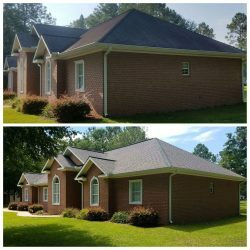 Slate roofs are expensive, and there is no need to replace the slate just because they are covered in moss, algae, mold, and lichen. But cleaning can be difficult when the slightest pressure can make your slate crack. 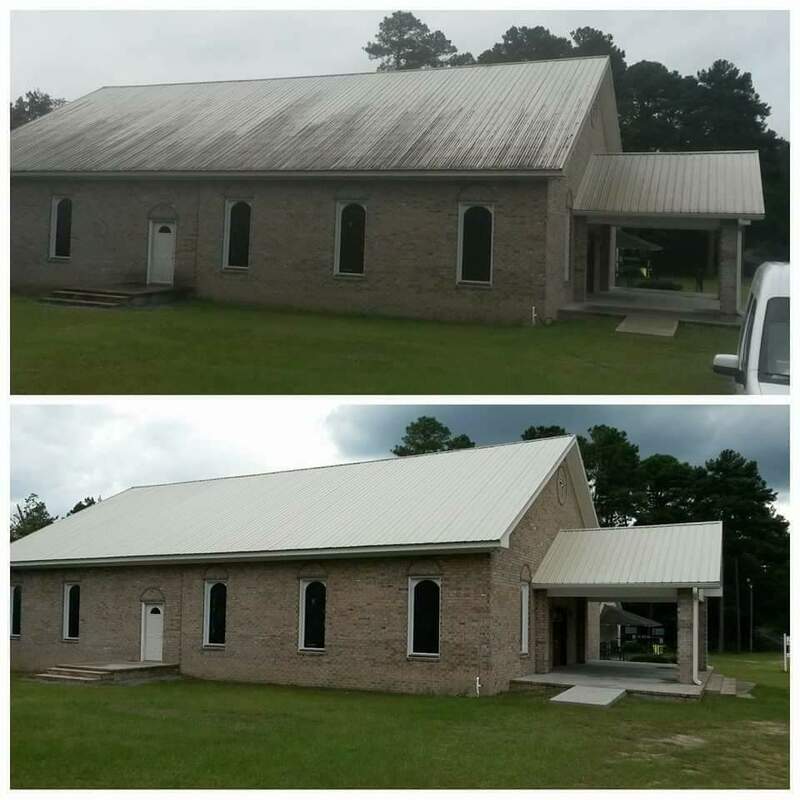 At Clear Water Prowash, we never walk on your roof or apply high pressure. We use ladders to apply our non-pressure application. Our specialized cleaning solution also does not to remove the needed oil found in the slate or dull the appearance. 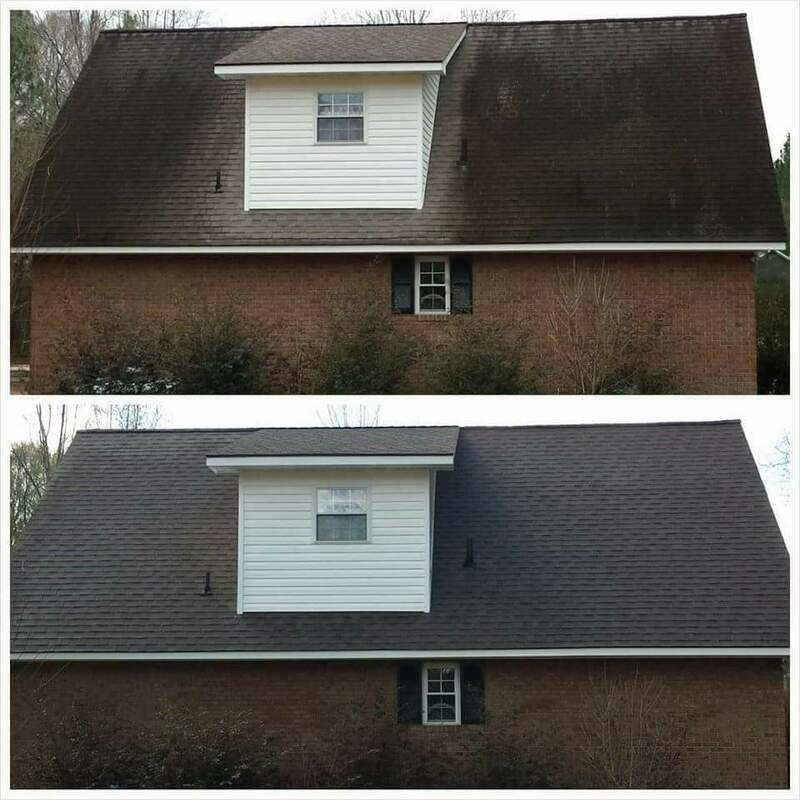 No matter what type of roof you have, our roof cleaning team consists of no less than two trained technicians. Treating your property like our own, we not only care about your roof but your property as a whole. 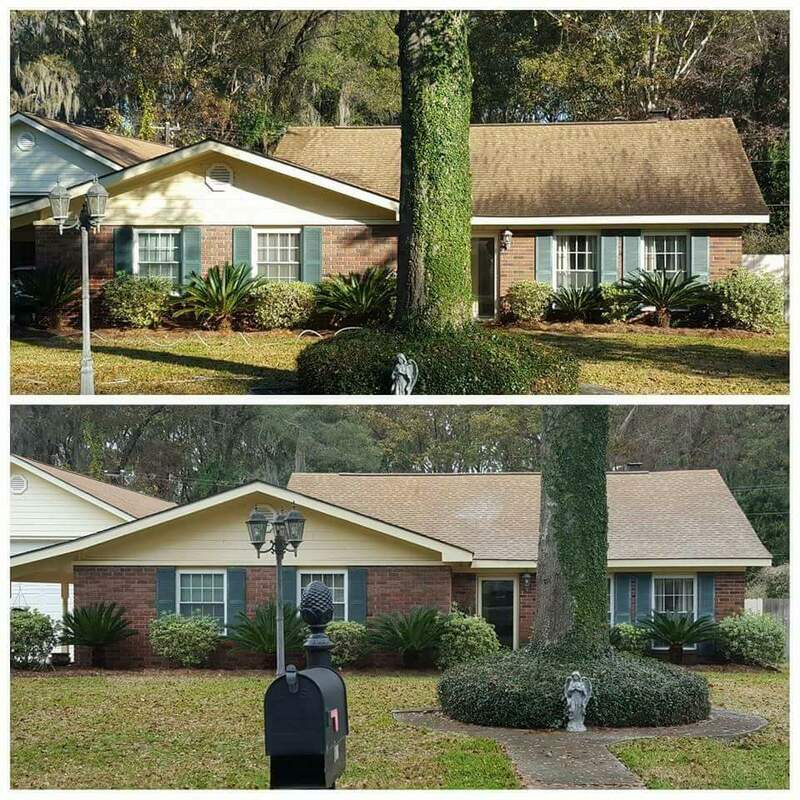 We will water your landscaping before, during and after the roof application, ensuring your plants will not be harmed. 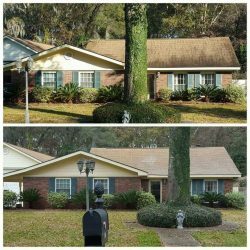 Once your landscape is taken care of, we will apply the specific cleaner (per your roofing material) with a soft wash application. 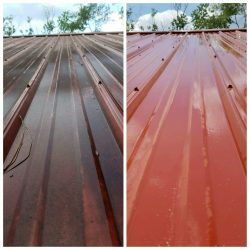 Different roofing materials require a specific cleaner. We will spray on the cleaning agent from the ground, or the gutter line, utilizing a ladder and ladder standoff stabilizer. Gutters will not be damaged using these safety tools and we do not over apply our solution causing run off. After the application is complete, we rinse the gutters and applying a neutralizer to both your soil and gutters ensuring their safety. Leaf or debris removal is not included. 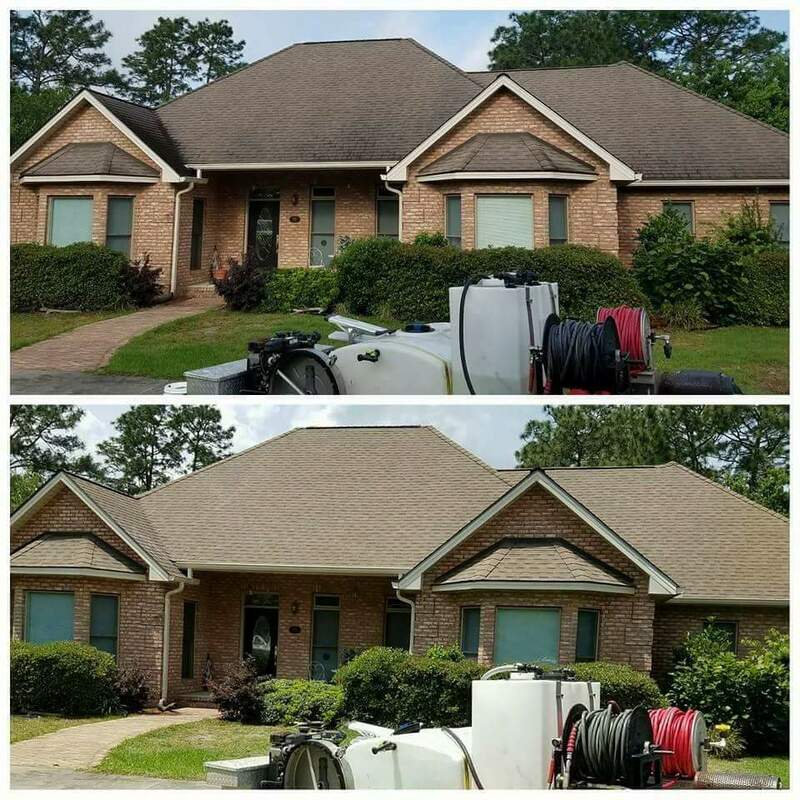 With gutter cleaning, power washing services and more, it’s a good time to call the experts at Clear Water Prowash. Contact us today!